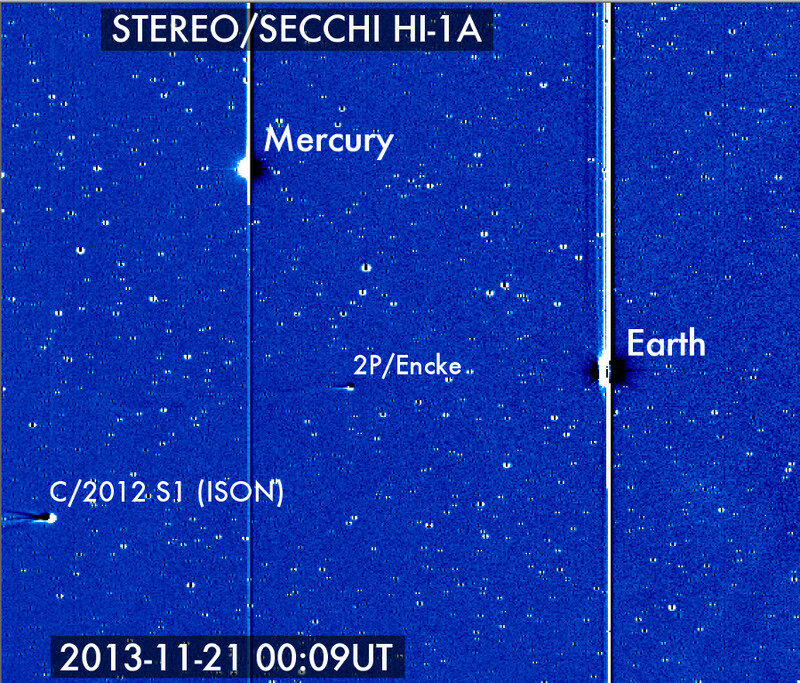 Explanation: Still intact, on November 21 Comet ISON (C/2012 S1) swept into this animated field of view (left) from the HI-1 camera on the STEREO-A spacecraft. The camera has also captured periodic Comet Encke, Mercury, and Earth, with the Sun cropped out of the frame at the right, the source of the billowing solar wind. From STEREO's perspective in interplanetary space, planet Earth is actually the most distant of the group, seen in its orbit beyond the Sun. Mercury is closest, but both planets are still so bright they create sharp vertical lines in the camera's detector. Both comets clearly sport substantial tails, but ISON is closer to the camera and will continue to move more rapidly through the field. Cameras on STEREO and SOHO spacecraft will be able to follow Comet ISON as it falls towards its close encounter with the Sun on November 28, even as ISON gets more difficult to see in the bright dawn skies of planet Earth.